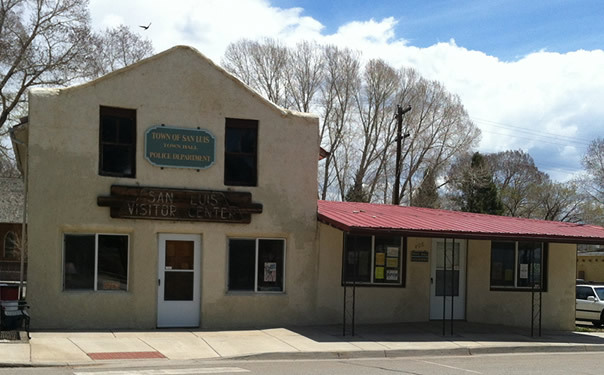 The Town Hall of San Luis also serves as our Tourist Welcome Center. Situated just across the street from the pathway to the Shrine of the Stations of the Cross at 408 Main Street, the Welcome Center is a must stop before hiking up the hill to view the Station of the Cross. There are loads of brochures to peruse if you are wanting to find some of Colorado's best kept tourists destinations. Restrooms are available. Come in to say hello (We'd love to meet you!) and sign our guestbook so we know you came to visit the Oldest Town in Colorado. The Welcome Center is open Monday through Friday from 8 am to 4 pm.